Many people believe resistance training using dumbbells, barbells and other weighted devices are a much more effective way to train for strength and body transformation. Depending on the goals to be achieved... this may very well be the case. While I contend weight lifting of many types should be a part of everyone's overall fitness plan... this option is not always available or recommended. What if you have no prior experience with physical training? But what if you can't get to the gym? What if you don't have access to equipment? 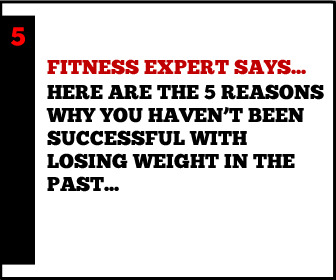 What if those "effective" weight training sessions are far and few between? Bodyweight calisthenics exercise done on a consistent basis will produce superior fitness, health and physique results than the most effective, sporadic weight training. 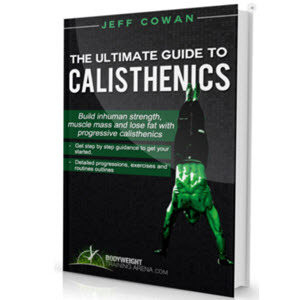 The accessibility and versatility of bodyweight calisthenics exercise makes it the perfect physical training method for consistent improvement. If you have a functional body, there is no excuse for not making physical activity a part of your daily lifestyle. Furthermore, just because the resistance used to improve is the weight of your own body does not mean your progress has to be limited... especially if you use these 6 ways to make bodyweight training more effective. When your brain thinks your body is stable and there is no threat of injury... it will activate the optimum amount of muscle fibers needed for a particular movement. If your brain senses you will injure yourself... it will try to prevent this by not allowing all the muscles to be activated. Your core, the source of all power and stability in your body, can be made more stable by pulling in your stomach below the navel. You must contract the lower portion of your abs for this to be effective... which is harder than just sucking in your stomach. By contracting your lower abs, you make the spine more stable... sending the message to the brain that it is alright to activate all the muscle fibers needed for movement without the fear of injury. To practice the feel of contracting the lower abs... lie on you back and place your hands just below the navel. Push your stomach out as far as you can, then contract the lower portion and hold for 10 seconds. Use your hands to feel the lower portion of your abs contracting. Doing this before and during exercise can create a more stable core from which you can exert forceful effort without the risk of injury. By reducing elastic energy you can increase muscle involvement. Your muscles build up elastic energy in the negative portion of the exercise... energy that can is used on the positive portion of the exercise. For example, when you squat down, your legs store elastic energy just like a coiled spring... and use this energy to help complete the raising portion of the squat. Using this elastic energy reduces the amount of work the muscles have to do. Australian researches found it take 4 seconds for this elastic energy to disperse. Therefore, pausing for 4 seconds in the down position will force more muscle to be used in the positive movement because there will be no elastic energy helping. therefore I suggest using it sparingly for progression, but not exclusively. Furthermore, in the activities of sport, work and life you will take advantage of the stored up elastic energy to complete movements... so you should also train to optimize the use of this energy for optimum performance. The longer your body is while performing a movement, the weaker it becomes... making the stress on the muscles performing the exercise greater. By increasing the distance between the muscles doing the work and the rest of your body, the exercise becomes more difficult. For example, performing a crunch with your arms across your chest is easier than with your hands on your head... both being easier than with your arms outstretched over your head. The longer you make your body, the more difficult the exercise becomes. The less contact your body has with the floor, the more muscles it must use to compensate. The more contact with the ground, the more stable the body is. Therefore, by making your body less stable by limiting contact with floor, your body is forced to use more muscles for stabilization. Doing exercises while lifting one foot or lifting a hand from the floor will increase difficulty. The human body can move front to back, up and down, side to side as well as twisting movements. Perform exercises moving in more than one direction and you increase the difficulty of the movement. Adding rotation by twisting your hips or torso to any movement likewise increases difficulty. Furthermore, real life activities in work, sport and life happen on all planes of human movement... and not just in single planes of movement in a highly controlled environment. Not only will exercising in multiple directions add difficulty... it will better prepare you for the real world in which you live. The further you have to move, the harder it is... and the harder it is, the more muscle is needed for completion. 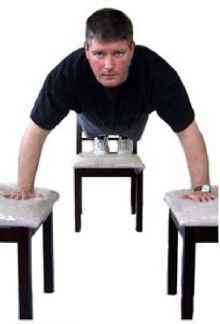 Increasing the distance of each repetition increases the difficulty of the exercise. Move the floor further away by using a stable object for your feet, hands or lower back. As you look through the exercises you will see these methods being employed either separately or together to make the exercises progressively harder and more effective. 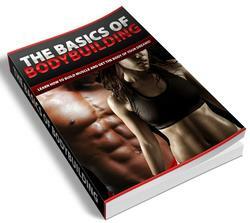 Take these methods into account when you are building your own fitness training program to increase or decrease difficulty according to your goals, needs, wants, abilities and limitations.